This special tribute render will be up for the rest of Halloween night. Tomorrow it go back to the regular version (until next year)... I hope the Great Pumpkin will pick my pumpkin patch, but if not mine then I hope he visits yours soon. Happy Halloween! 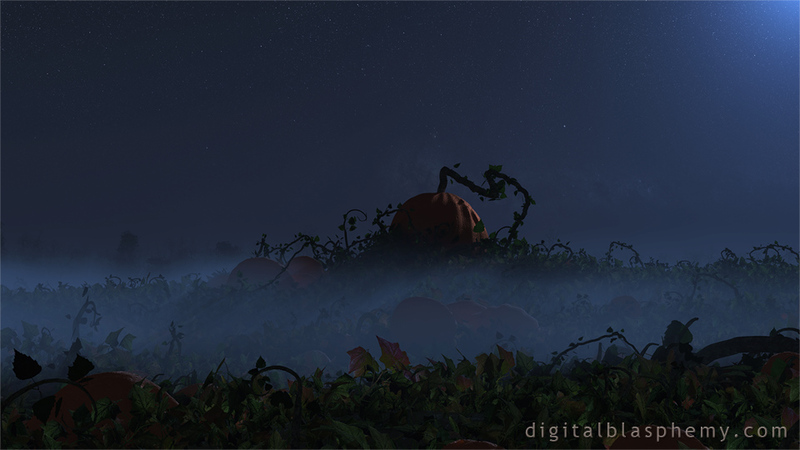 I created the vines and pumpkins in Plant Factory and rendered the scene using Vue d'Esprit 2015. The scene is intentionally dark and mysterious to put you in the POV of Linus sitting his vigil. The picklejar version with the fog and shadow is one of my favorites on your site. Please bring him back this year! ..been waiting a year for this... miss it the last time... haha amazing! "Back to the regular version..."
"A Sincere Pumpkin Patch" is back to my original version. I may post the special render again 10/31/16! Linus is the eternal optimist as he continues to await the arrival of the great Pumpkin. One wonders what he plans to do once he meets Master Pumpkin? Entertain thoughts of pumpkin pie? I love your work! This I'd fantastic! I've updated the 3440 x 1440 sorry. People may need to reload the file that pops up in their browser if it is the same as before. This is much better. Thank you for making the changes! Love Tim's stuff - this one has a sharper edge to it. Takes it off the 'big screen' as it were and drops it into my immediate purview. I like it! Now all it needs to make it really scary is a full moon ! Being Australian, Halloween is something I don't really feel that deeply about, but Ryan's Halloween renders are always pretty cool. I like it! Not over the top (which isn't bad) just right. Put on some orchestral film score music and it almost changes before my eyes. The debate: I'm reminded of the conversations back in 2007 over "All Hallow's Eve"; Oh my..... some said: "Way to dark, other's the pumpkin is too scary, then too friendly!!! Ahhhh....... Halloween is different things (or nothing) for different people. Hey, if I had my wish; I'd love to see a dark silhouette cutting through the fog of Snoopy with his WWI cap and goggles! Variations on Halloween is the perfect subject matter for the Pickle Jar. I love the Pickle Jar. (Kind of a grown-ups Where's Waldo! OK, what did Ryan change in this one???). "I can really feel Halloween spirit "
This one manages to be spooky without any obvious supernatural elements. The mist and the light add to the ambiance of the scene nicely. This is good. The only thing I would change, if I could, would be to use Pumpkin leaves instead of ivy. The leaves here are just too small. The way the moonlight casts it's shadows is awesome. Spooky! I kind of wonder what Linus sees so fascinating sitting in a humid patch of pumpkins. He may be waiting for the Great Pumpkin, but he might meet up with the Wicked Witch! If you were sitting out all night in a very sincere pumpkin patch (such as this) perhaps your imagination might start to play tricks on you. I think it would be fun to explore those possibilities in the days leading up to Halloween. Love it, and love the inspiration behind it. It looks terrific in rotation with your other Halloween masterpieces. If you wanted to put up a version for the non Great Pumpkin believers, you might consider a scarecrow and perhaps a black cat or two along with your jack-o-lantern. Love the dim light and spooky feel. If I were to imagine a lonely pumpkin patch late at night, it would look just like this. Thanks for your work. Amazing detail. So perfect for the season. I really love the fog and all the vines. I see your point with regards to the lighting and coloring. It certainly doesn't have a lot of "sizzle". I may do some more work on the central pumpkin and post a new version. The side pointed away from the camera actually has a jack-o-lantern face that I ended up not using. It just didn't fit the original Peanuts inspiration. 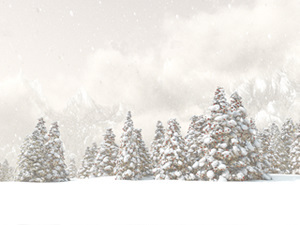 First off, I want to say that I love this site, and most of the wallpapers are amazing. 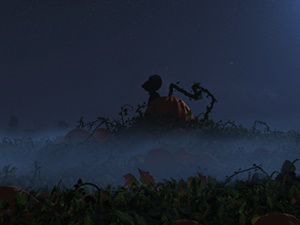 But I was disappointed with this Halloween wallpaper, it is just too dark, something needed to be done to highlight the pumpkin or somehow bring in more color. I have to agree with Mike; this one doesn't float my boat. It seems very sparse and is "kinda boring". Maybe it's because I don't get the references; I didn't grow up with Peanuts, don't know the relevant story, and Halloween itself isn't the thing that it is in the USA over here in the UK. It is really awesome! The lighting and mood are just right - excellent work! It's kinda boring. Maybe if there was a volcano in the distance shrouded by the mist with crooked fingers of lava snaking down the mountain. Just that. It's awesome. Might be slightly better if it was zoomed out just a bit. (I'm using 5760x1080), but it's still REALLY good. "There he is! There he is! It's the Great Pumpkin! He's rising out of the pumpkin patch"
Nice and spooky. Is that a beagle rising in the background? This is absolutely one of my favorites! Thanks so much. Not one of my favorites. Sorry.